Blockchain. Robotics. Machine Learning. Edge Computing. Cryptocurrency. IoT. VR. AR. AI. Only the most forward-thinking software engineers and data scientists claim to understand the multiplying variety of disruptive digital technologies and trends invading our organizations. Even worse, the business leaders deciding how to deflect, adopt or simply question the impacts of these disruptors on their strategies and stakeholders are handicapped by biases of superiority, optimism and illusions of control. As analysts, the confusion we feel when assessing the potential impacts of these trends on the companies we serve is frustrating and demoralizing. Why can’t leaders admit we know less than we think we do? Digital disruption is a case of the arrogant leading the confused. These specific flaws are not unique to business executives. Our biases are universal human characteristics designed to bring us comfort in an unforgiving world. Humility offers us a path to understanding this changing world, adapt to its disruption, and thrive in its aftermath. Intelligence people have a unique role in the organizations they serve as catalysts for humility. Their efforts succeed through a deep curiosity about the world around them and their place in it – a curiosity driven by the knowledge that their initial assumptions will probably be wrong. Humility is the currency of intelligence. Confronting the truth about the impact of digital disruption on our businesses offers the rare chance to humble organizational culture, make leadership teachable and grow empathy about how to cope and adapt. The values embodied by humility are in stark contrast to many accepted (and respected) business norms: empathy versus apathy; generosity versus selfishness; honesty versus deception. Those lacking such values share one consequence with the businesses they lead: they’re not teachable. There’s nothing you can tell them they don’t already know. That may have worked before the age of digital disruption. It works no longer. 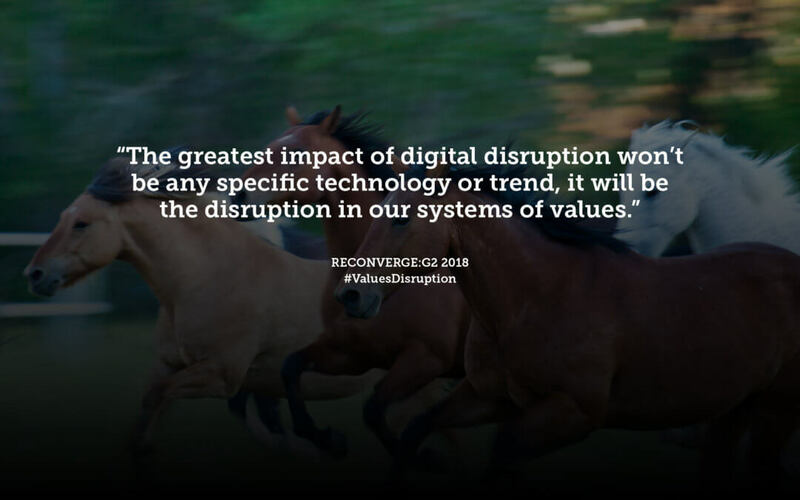 The greatest impact of digital disruption won’t be any specific technology or trend, it will be the disruption in our systems of values. That is the driving force behind this year’s RECONVERGE:G2. We’ve built an entire 3-day conference around three critical values that all organizational leaders must embrace to succeed in this brave new world: Teachability, Humility and Empathy. We will not adopt these values by simply thinking about them, or reading articles, or listening to lectures. We must explore them together in person. Register today for the RECONVERGE:G2 conference and we will take these first steps together on the journey to build this new values system. I wish you a relaxing weekend. And on Monday, I’ll introduce you to the co-chairs of the next RECONVERGE:G2 Intelligence Leadership Symposium and describe how they see these values saving businesses in a future filled with accelerating change and existential risks to their continued sustainability.